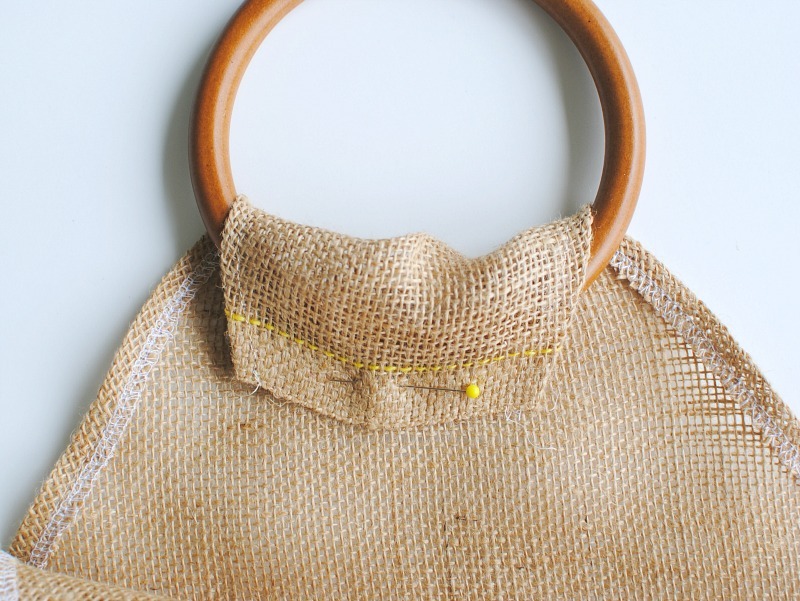 Trash To Couture: DIY Wooden Handle Burlap Purse. 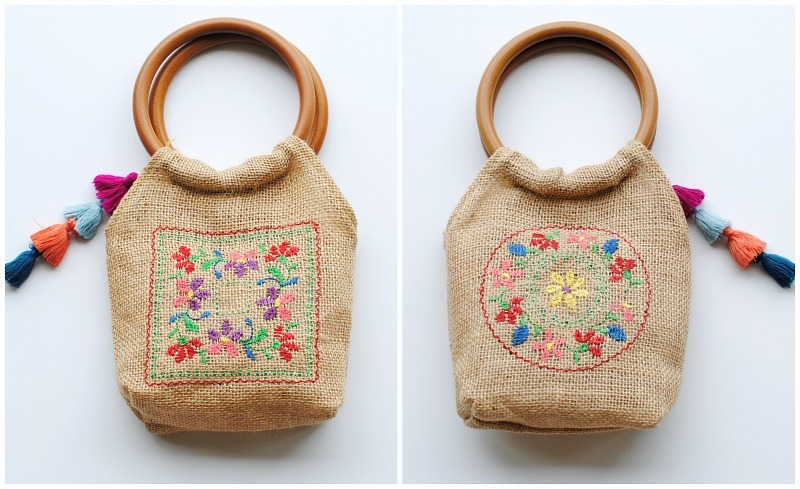 Lately I'v been seeing a lot of burlap fabric and wood handles incorporated into handbags and it inspired me to try and make my own version. 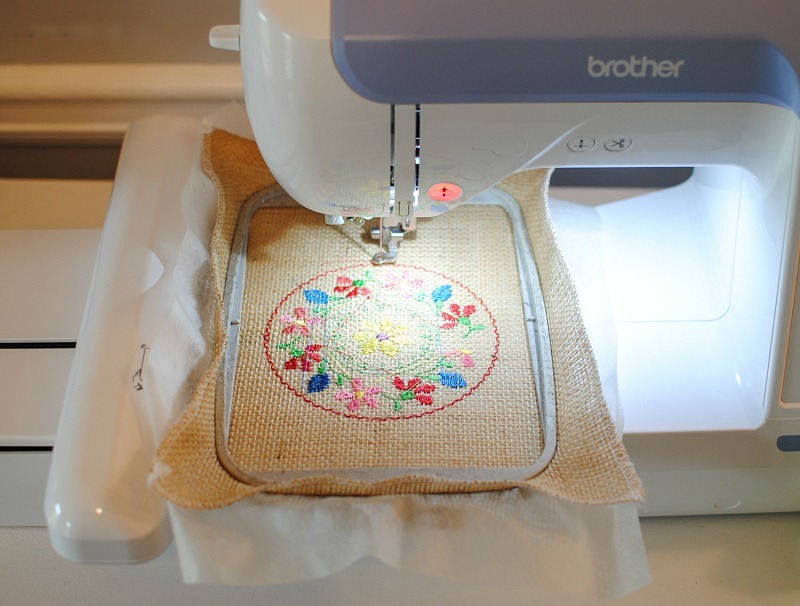 Because the burlap is a boring material I wanted to add embroidery. 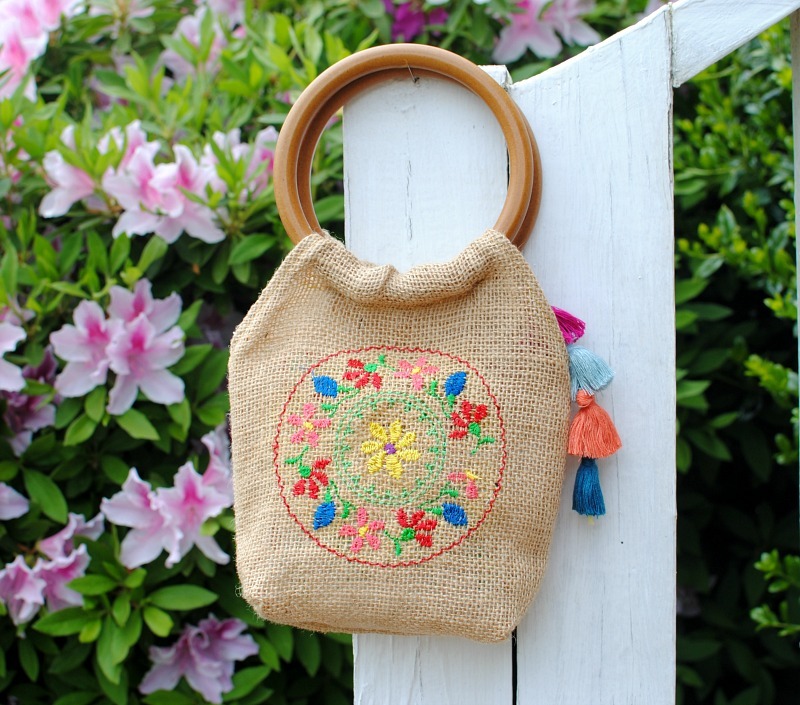 I loved the combination of this Folk Stitchery embroidery collection with the burlap and wood handles. I embroidered onto the front and back using Coats & Clark Polyester Embroidery Thread which really gave it a pop of color. Get the details below and make your own. Cut 2 rectangles of burlap fabric in 9 x 11.5" . If you have a serger it's a good idea to serge the edges to avoid fraying. Use a water soluble stabilizer like AquaMesh WashAway and hoop. As far as the embroidery keep in mind you will have a 2" bottom squared off and a 2" fold over the top to sew the wood handles. 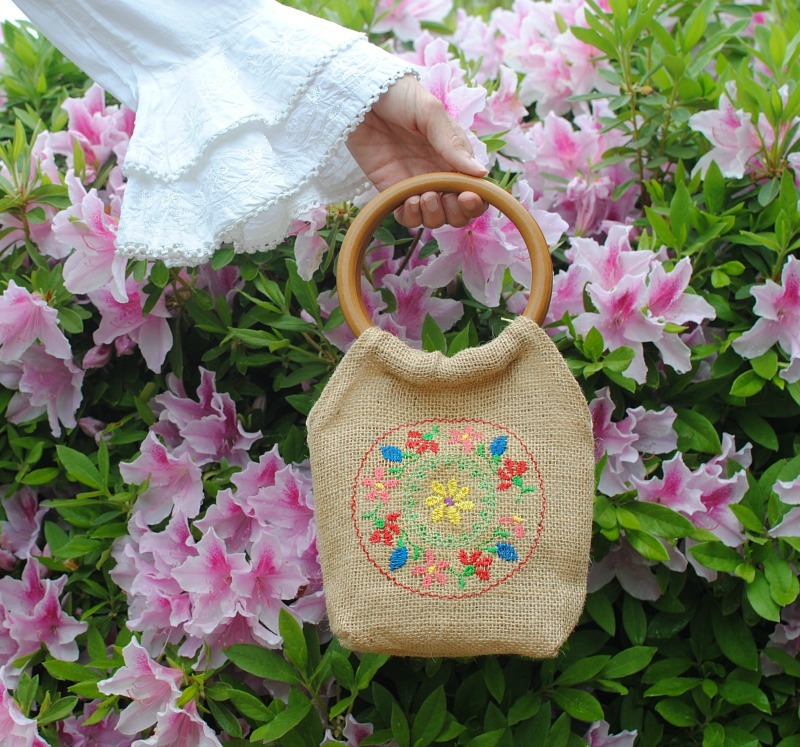 Center the design and embroider! Remove the excess stabilizer by cutting around the edge and the remove the rest with water. For the topstitching I used Coats & Clark Jeans Topstitching Thread 8145 Red Orange. Fold over the sides to angle off the top and press flat (mine was about 4" down). 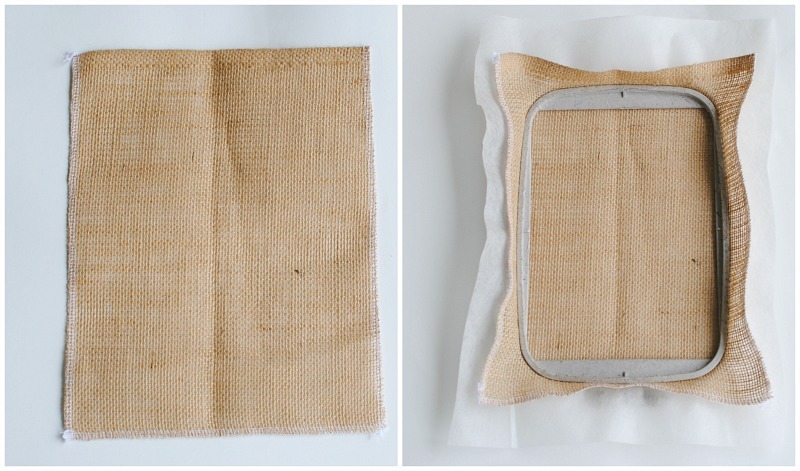 Sew a 1/4" hem. Remove the additional seam allowance and fold over again and sew another 1/4" hem. Place front and back right sides together and sew sides and bottom with a 1/4" seam allowance. If you didn't serge the sides you may want to add double bias tape and sew over the seam allowance at this point. Fold bottom and side seams together at the bottom corners. Pin about 1 1/4" up. Sew across forming a squared bottom. Last fold the top of the bag over the wood handles and pin. 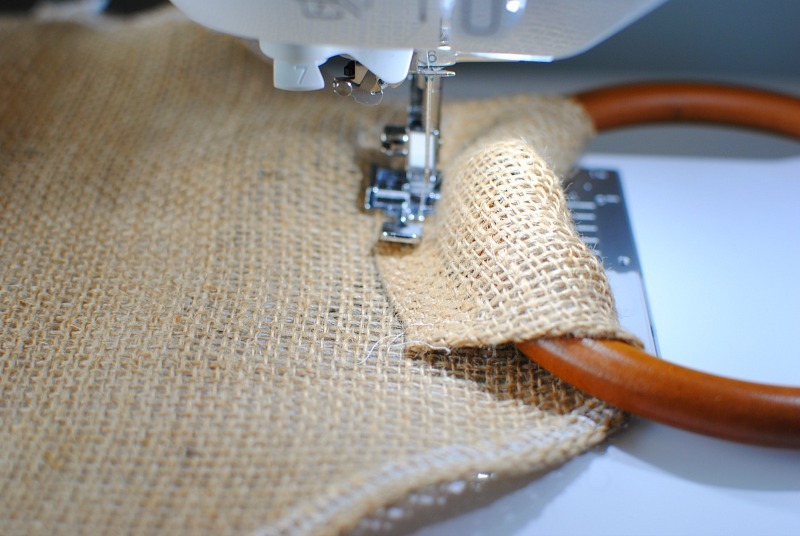 Use a zipper foot to get close enough to the wood handle but not too close the needles hits. 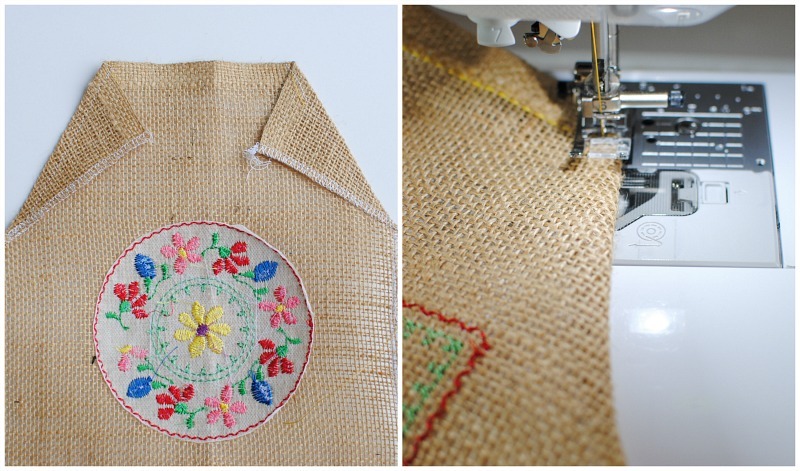 Sew along till the end. 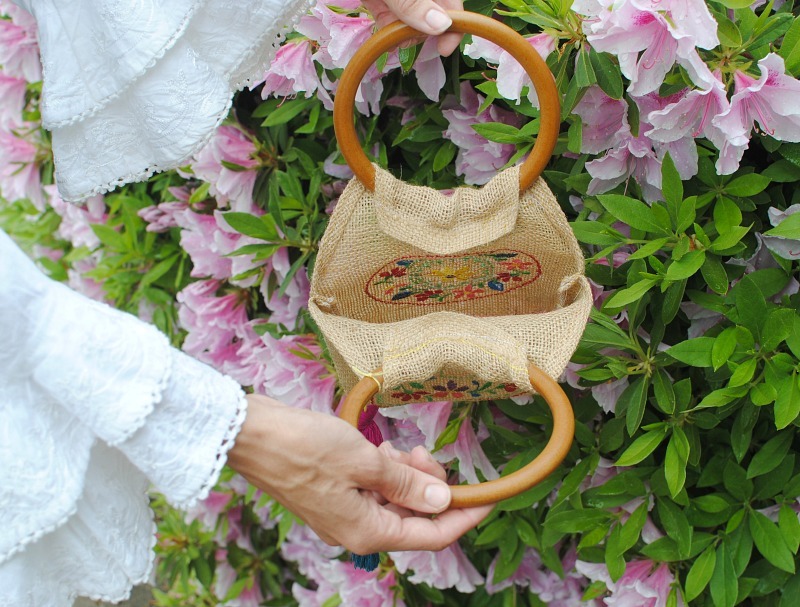 You can always hand sew this portion as well if you're having trouble getting the wood handles underneath. I loved how this turned out. I made a big one as well for the market you can see here. 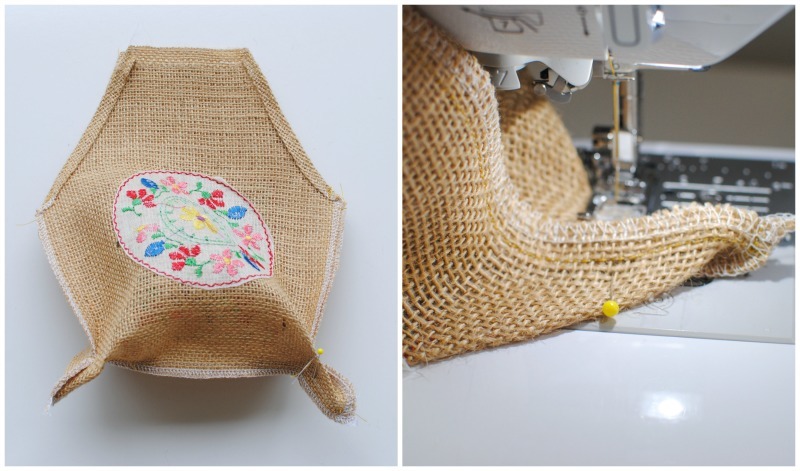 Thanks for sharing some beautiful and useful tutorials to make handmade bags. These ideas are not only easy but clever and genius. 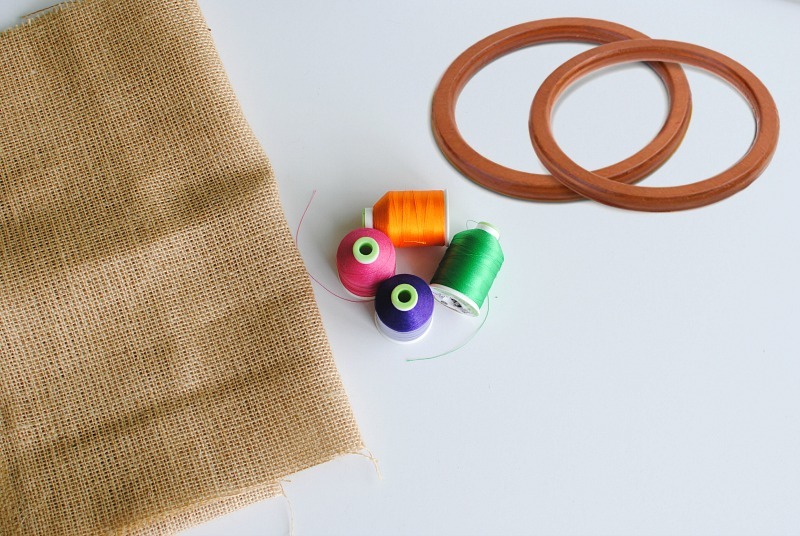 Thanks for sharing this article here about the burlap bags. 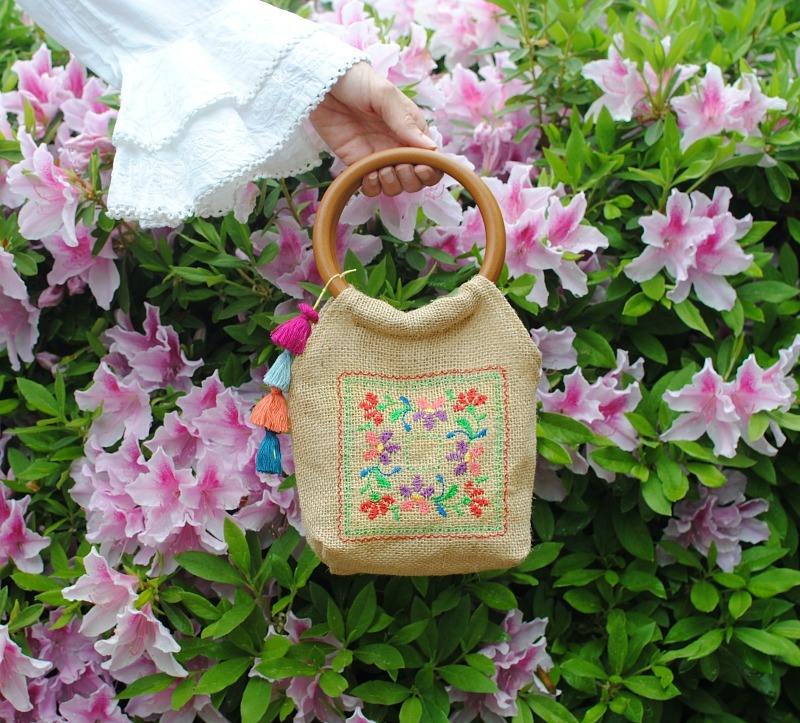 Your article is very informative and useful to know more about the process of making Wooden Handle Burlap Purse. keep sharing this type of articles here. Thanks for sharing this trick I like your way awesome.